Aerial | Roping Towards a Ph.D. This has been a particularly difficult year for me. My thesis major corrections has been a big blow to my confidence, but I am grateful that I am slowly coming out of it with the help and support of good friends. The aerial side of things has been completely different from my academic work. I feel stronger, more motivated than ever, and feel much closer to my dream of teaching aerial one day. 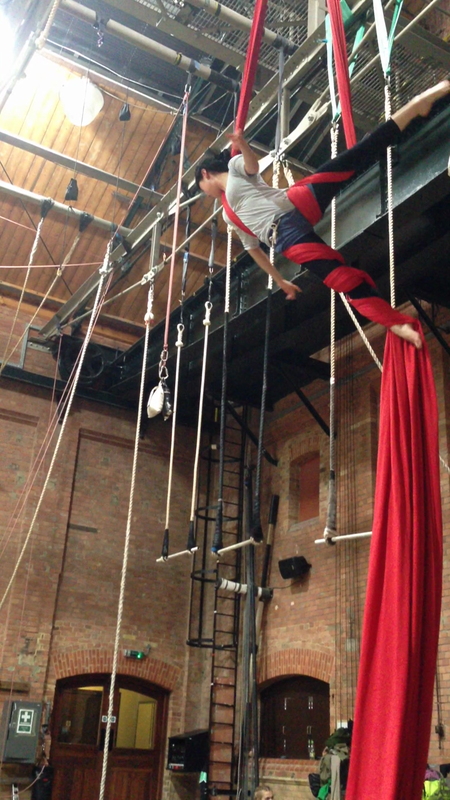 I completed a 12-weeks Silks Level I evening course at the Circus Space this term and never missed a class. That’s a back and forth two-hours journey to London once every week. Once every week might not seem much, but when you’ve got a thesis correction schedule to chase, spending the afternoon and evening on the road feels like a sin. But I feel it has kept me sane, giving me something to look forward to and be excited about. We had a very good teacher for our silks class. She’s methodical on wraps and this has helped me become less afraid of drops. So my new year resolutions is simple: work hard and play hard. When I work on my thesis I won’t think about my next aerial class (this is very hard considering the amount of time I get distracted doing “aerial research” on YouTube). When I train I won’t think about my thesis. Piece of cake. I need to come up with a more efficient schedule to fit the one thing that I absolutely have to pull through, and the other thing that I love. This is my first two-rotations drop. 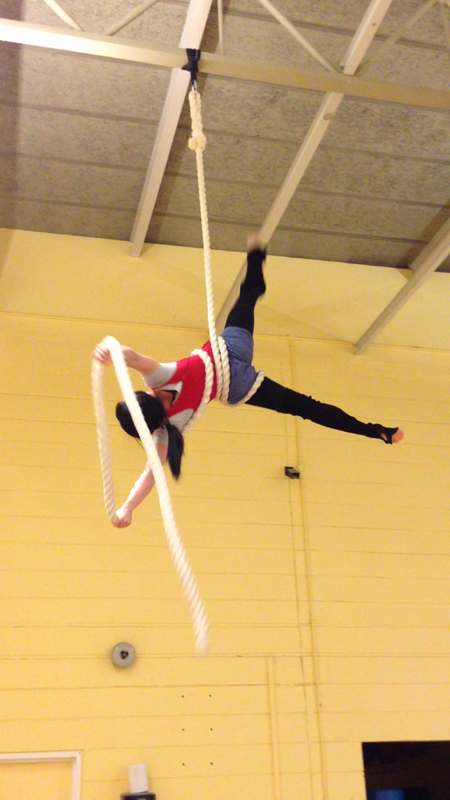 I first learned this drop on the silks and then transferred it to the rope. I’m still bewildered every time I do it: your eyes are open all the way through the drop but you don’t see anything because one, gravity is pulling you quite quickly, and two, you’re concentrated on keeping body tension. I’m always amazed at how different a drop feels on your body compared to seeing someone doing it. I might be side tracking a bit here, but this is one of the reasons why you should NEVER, EVER try to replicate a drop from YouTube. Admittedly I tried to copy a double-knee hock drop that I saw on the internet when I was a beginner/improver. I thought, “Hey, how difficult can it be?” I was tangled up with the rope squeezing me out of air. NOT a good idea. My point is that taught safely the curly-wurly is a fun drop to do. Working with split silks means that your relationship with the apparatus is slightly different. I love being able to grab a bit of fabric and lay out. The material of the fabric offers alternative ways of movement. I feel that my spatial awareness has actually improved by gaining more vocabulary on the silks. It also feels really good to be able to work on another apparatus when the rope is giving me a painful hard time. I’m also working on my straight-leg propeller and flare-into-catchers. They’re getting there! So with these reflections I conclude my last post of 2013. Thank you for reading/following my blog. See you next year! Posted in Aerial and tagged aerial, Aerial silk, Circus Space, Corde Lisse, major corrections, new year resolutions, PhD, Rope. Bookmark the permalink. EADF photos and video released! The photos and video for this year’s EADF (European Aerial Dance Festival) have been released! I’ve been looking forward to these and was happy to find they’ve finally uploaded them. Browsing through the photos reminded me of what a great week it was. The weather was unusually warm even for July-August in Southeast England, so it finally felt like a proper summer. The workshop also helped dispel my post-viva trauma blues. I did the workshop with a couple of friends. We train together on a regular basis so it was great fun to do the workshop together. The EADF is a week-long aerial workshop that takes place in Brighton, UK in the beautiful Brighton Dome every August. These classes include counter-weight, static trapeze, corde lisse, silks, and harness. I haven’t tried the counter-weight or the harness classes yet because I don’t have the equipment to practice with afterwards, but I’ve heard they’re a lot of fun. When I did the beginners/improvers corde lisse workshop last year, I already had one year of aerial experience, but I still found it very challenging. I’d never trained for five days consecutively, so by Wednesday my muscles were incredibly sore and tight. It was the first time I dreaded doing aerial. I felt weak in the air and I was afraid I’d lose grip. Luckily my friend Michael was in the same class so he kept spotting me. This year I decided to go for the beginner/improvers dance trapeze and intermediate/advanced corde lisse workshop. It was still very tough, but I managed to keep up. Since they scheduled the corde lisse workshop over the weekend, by the time we started the corde lisse class I’d already done five days of trapeze. I didn’t realize how tired my body was until Saturday. I know this is a piece of cake for circus students, but it’s the first time in my life that I’ve done physical training for a whole week and managed to survive. I did get injured and I had to go for a couple of sports massage sessions afterwards, but it was a huge improvement from last year so I was very proud of myself. If you’ve been doing aerial for a while and are thinking of adding new vocabulary to your routine, learning technique from a different teacher, or wonder what it’s like to train intensely, I’d recommend trying the EADF. The teachers are patient, generous, and know how to teach. Besides, it’s Brighton and the seaside in the summer, what can go wrong? 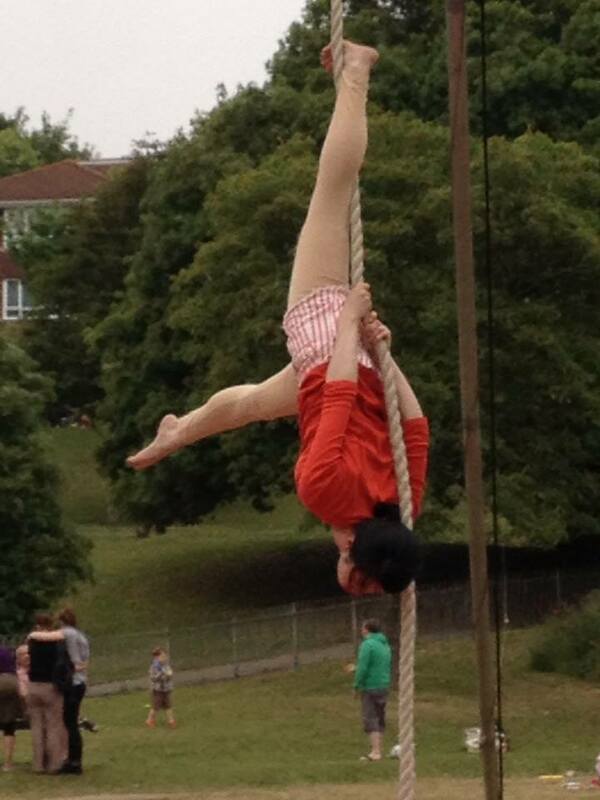 Posted in Aerial and tagged aerial, Brighton, circus, Corde Lisse, EADF, Rope, Trapeze. Bookmark the permalink. 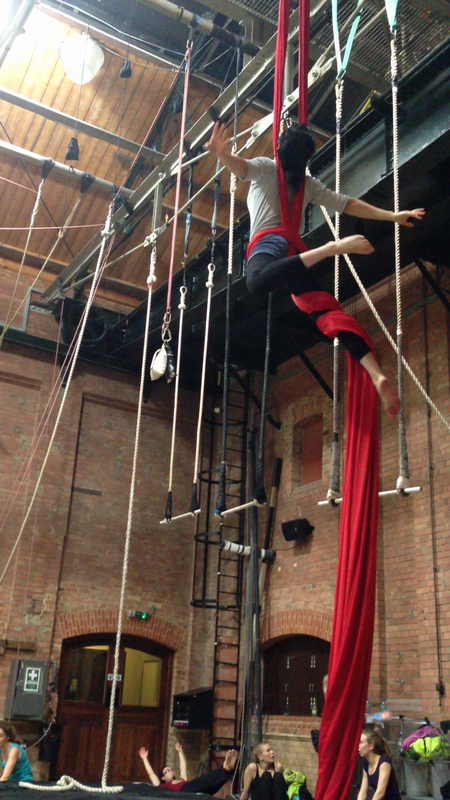 My silks teacher was ill on Tuesday, so I booked in for an aerial conditioning class instead. I’m used to conditioning at the beginning of a class when I’ve still got energy. This involves two to three sets of exercise, such as beating and sit-crunches on the trapeze bar, or pencil-pike on the silks. But this Tuesday was the first time I’ve done an hour-and-fifteen minutes class just pure conditioning. I tried going through the fifteen or so exercises on rope that were on the exercise sheet, but most of the times I couldn’t hold on for as long as required, like a single arm and toe hang for 30 secs.. Other times I could only get through one set instead of two sets of exercise. In the middle of panting, bewilderment, and staring blankly at the ropes I asked myself why I was doing this. Well, I already bought my train ticket so I HAD to come… Basically I’d gone all the way to London for self-inflicted torture. But of course I know why we do conditioning. We do conditioning so we can execute more cool stuff in the air, to stay in the air for longer, and to enjoy that temporary moment of freedom. It’s the feeling of being at awe with ourselves (kind of narcissistic) that makes us go back for more. But conditioning is pretty boring. It’s repetitive and I find it more self-defeating than learning a new move because there isn’t a reward in itself, like a pretty pose or a flashy move. But as with many boring things, it’s necessary. The repetition of conditioning helps strengthen the muscles and build muscle memory, and that’s the reward on the long run. When you’re stronger, you feel more confident and it reduces the chances of injuries or panicking in the air when you end up in a funny wrap. You train the muscles when you learn new moves, but when you’re stronger it makes the process of learning new moves easier. 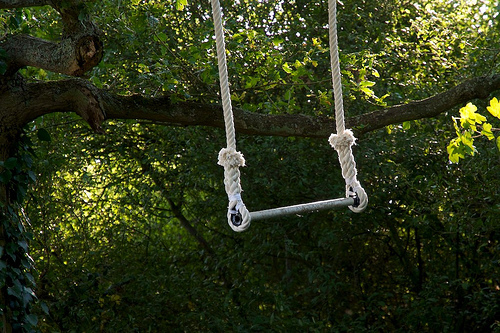 I’d love to rig my own trapeze under the tree one day. I felt very anxious and nervous the first couple of times I tried beating because I was scared of losing my grip (plus it was really hard to swing my legs to the bar!). But when I got used to it I found that it really works the muscle group under the arm near the shoulder blade. Gradually I was able to hold myself longer with more stability in the air. Now that I can enjoy swinging beating has become one of my favourite conditioning exercises. What do you do for a stronger aerial body? Posted in Aerial and tagged aerial, circus, conditioning, exercise, Rope, Silks, Trapeze. Bookmark the permalink. 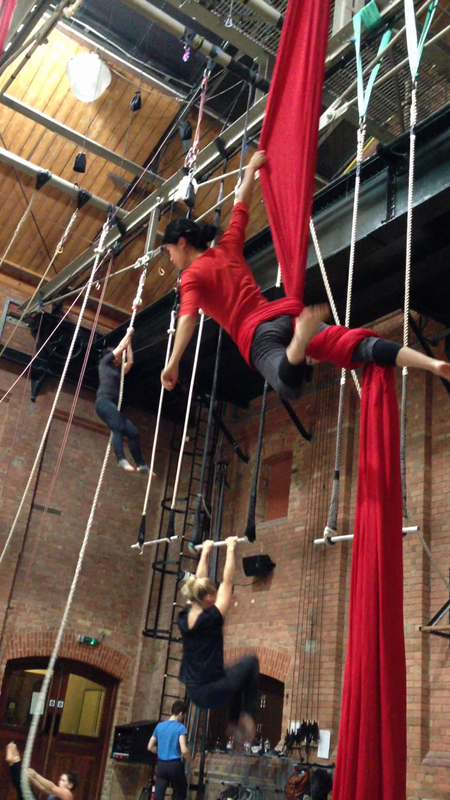 I’ve started doing a silks evening course at London’s Circus Space this term. If you want to do evening classes at the Circus Space but didn’t start at their Circus Level 1, you’re required to take an assessment. I did my assessment in July, and was lucky to be offered a place as their waiting list can be very long. I was hoping to book a rope class, so when they called me to say they had a cancellation in silks I was hesitant to take the place. The student canceled her booking two weeks before the course started, so the woman who called me wouldn’t let me think it over night as they needed to confirm places as soon as possible. If I didn’t take the place she’d had to move on to the next person on the list. “Can I at least have ten minutes to think about it?” I asked. I was taken aback by the situation because the woman was a bit pushy. But I decided to take the place since I might not have this opportunity again. There aren’t any aerial classes open to the public where I come from, so I’m trying to learn as much as I can. The evening course is a two-hour class that takes place once a week and includes a warm-up session. The Circus Space is almost militant about asking students to arrive on time to warm-up. If you arrive late, you’re not allowed to join the class. I guess this arrive-on-time policy is implemented with the good intention to lessen the students’ chances of getting injured and minimize disruption to a class, but it makes me a bit nervous because it takes me an hour on the train to reach London and the trains are often delayed. You also have the choice of booking inclusive supportive classes that comes with the evening course such as stretching and aerial conditioning. It’s a shame that I don’t have time to go to London twice a week so I haven’t been to these. Before I started doing the course, I thought going to London once a week would be no hassle, but now I realize I hadn’t taken into account the time it takes me to get to the train station, which is already about half an hour. I need another half an hour from London Bridge to get to the Circus Space (even though it’s only six minutes on the tube). I surprised a girl in my class when I told her I was taking the train back the same evening. “I know, it’s a bit crazy,” I said. “We’re all a bit crazy,” she sighed. Turns out she’s doing three courses at the Circus Space this term. I’ve been doing aerial for a couple of years now, and I’m still hungry for more. My friends have been surprised at my enthusiasm and dedication. I’ve always enjoyed sports but I’m not athletic, so I think they don’t exactly associate me with holding my body weight in the air. In fact, I love being in the air to explore the possibilities of body movement that seem to defy gravity. I also love the expression of body language. Different people favour different movements and tricks, so when you see a routine you can usually infer something about the performer’s personality through his/her choice of music and choreography. Me in an angel on rope. Training has also helped me become more self-aware about my body in general. I need to sleep and eat well in order to have a good training session. This doesn’t always happen, especially not when I wake-up at three o’clock in the morning in cold sweat worrying about my thesis, but I know where my fitness level needs to be in order to execute a routine. I’ve become stronger and for the first time in my life, I have shy abs. Even though training leaves me sore and tired, aerial is my highlight of the week and I rarely miss a class. It has kept me sane through the multiple setbacks of the Ph.D. When I get depressed thinking about my thesis corrections, aerial gives me something to look forward to. I struggle with finding self-confidence in the stuffy academic environment these days, but last week a girl in my class (the same one doing three courses at the Circus Space this term) asked me, “You have beautiful lines, were you a gymnast?” I secretly thanked for helping me feel better about myself. Since I’ve been training consistently, I know most of the aerialists in the city I live in. I regard myself as a friendly outsider learning about the difficulties they face balancing training and working, performing and paying the bills. The economic recession has been cutting to the arts sector, so the work of performing artists has really suffered from the lack of funding. I’ve learned that being in circus is not only about a profession, but also a lifestyle and attitude. Most aerialists I know hold a couple of part-time jobs, but they love aerial and circus so they stick with it. I don’t know how far I’ll go with aerial, but at the moment I still get very excited when I see a move I want to learn, or put a routine together to the music I like. Posted in Aerial and tagged aerial, circus, Circus Space, Corde Lisse, Performing Arts, PhD, Rope. Bookmark the permalink.